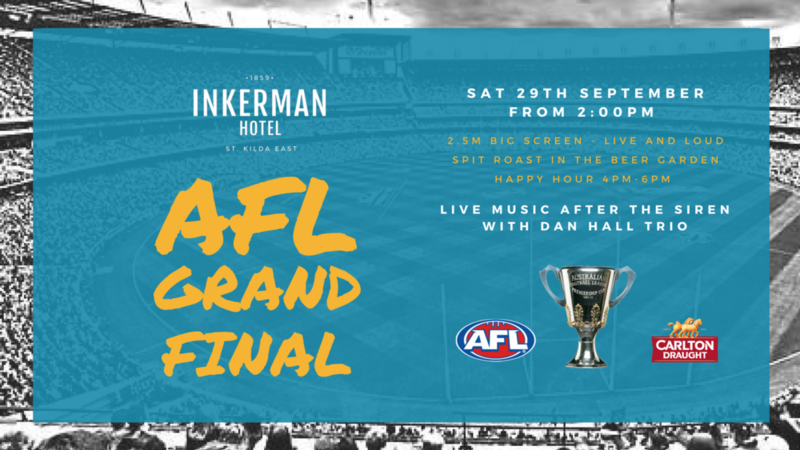 CATCH ALL THE 2018 AFL GRAND FINAL ACTION LIVE! Showing LIVE & LOUD on our 2.5m MEGA SCREEN + all numerous big screens throughout the venue. From 2pm with Doors Open from 10am. See the two teams go ahead while enjoying our GRAND FINAL SPIT ROAST in the BEER GARDEN!!! Will be continue our HAPPY HOUR on Grand Final day from 4pm till 6pm so a perfect time to celebrate your teams win or drown your sorrows from your teams loss. LIVE MUSIC after the siren with DAN HALL TRIO taking you into the night. Plus GIVEAWAYS and SPECIALS ALL DAY!! !